The Universe keeps throwing different possibilities at us, mostly in forms that we cannot recognize easily. Last weekend's WOW prompt was one such hint from the Universe. "The seat beside her was empty..." was the prompt that could set a million stories in motion. The WOW posts that we saw were a mix of love, longing and hope, and we would love for you to read them! 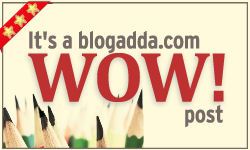 Congratulations to all the bloggers whose amazing work is featured below!